There are many complexities when delivering high quality TV subtitles to multiple device types and screen sizes. 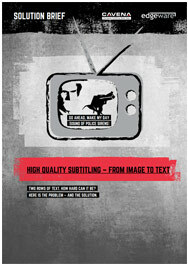 Subtitling is usually two rows of text with a timecode that determines when to display and when to remove the text. But there is an array of different formats and character sets that need to be supported. Edgeware offers the Cavena-based technology for the highest quality subtitling. Integrated with Edgeware’s TV Repackager product, the combined solution delivers high quality subtitling across any screen format, to any client and in any character set. Cavena TV Subtitling uses Optical Character Recognition to convert subtitles from image to text formats. This provides a much higher quality experience for OTT viewers. The system can also transcode subtitle formats with one subtitle format in, transcoded within milliseconds, and another format sent out.